First of all, I want to wish everyone a HAPPY NEW YEAR! If you're going to be on the road tonight, please drive carefully and watch out for others who may not be doing that. My wife and I will be curled up at home watching one of our favorite movies "HOLIDAY" with Cary Grant and Katherine Hepburn. Yes, it's an old B and W but the message it shares is very powerful and personal to us. That message is simply "Chase your dreams. Don't wait for things to happen, make them happen. Even if it means taking risks instead of playing it safe all the time. Hold onto each other as you go along because there might be pitfalls and you may have to go back to selling peanuts, but believe in those peanuts and each other. This way after you've analyzed what went wrong, you can try again and again until you succeed in making it that dream a reality!" Well gang,here it is. 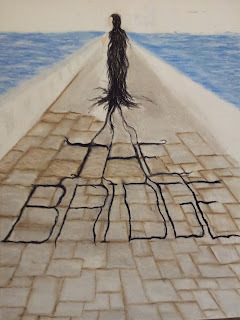 I finally finished the cover for my debut novel this afternoon. It took some doing but I finished it finally. With my tight budget and the fact that I'm an artist in my own right, it only made sense to do the cover myself. I've already got about a 1/4 of the novel formatted. 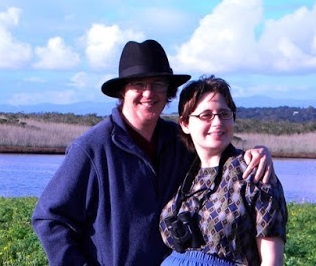 I'm using Createspace. I'll do another entry on what went into the formatting and why I made the choices I did. I hope to post that one in a day or so. I want to focus on finishing the formatting and getting the whole thing together before New Year's Eve if possible. In the meantime, any comments on the book cover would be welcome. A VERY MERRY CHRISTMAS TO YOU ALL. And if you are traveling, may your journey be safe and uneventful. See you all on Boxing Day, take care. This is the third and last installment of this video. This place has been a real joy for us and we hope to explore other places next Christmas as we get more familiar with our new surroundings. Remember, we've only been here since September. A MERRY CHRISTMAS AND A HAPPY NEW YEAR TO ALL! Here is part 2 of the video I shot of this magical place not from from where we live. This is all done by one man and his family and each year they add to the display and make it even more magical. I hope you enjoy seeing all the lights and figures and how carefully organized and set up it all is. The 3rd and final part will go up tomorrow. Enjoy everyone. Since I'm always going on about being creative and now is the holiday season, I thought I'd share this with you all. Here's part 1 of 3 videos about this one incredible house that is so incredibly decked out for Christmas. For me, it's like a holiday wonderland and I wanted to share it with you. I broke the video up into 3 parts because the entire thing is almost 20 minutes long. I hope you enjoy it, part 2 will be up tomorrow and then part 3 the day after. Now this is NOT my place, someone else did this incredible display. He and his family do this every year, they also do Halloween up big time and I hope to shoot that next year. In the meantime, please enjoy and HAPPY HOLIDAYS! 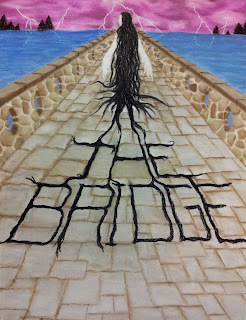 As you probably already saw in my previous entry I've been working on the book cover for my Paranormal/Mystery/Sci-Fi novel "THE BRIDGE". It's been an interesting experience. I do not recommend it for everyone unless you're an artist yourself. I'm loving it because I have way more control over the creation of the image that is going to basically be my "Introductory Handshake" to the world. I've seen images used on books that I thought were interesting but did not always have all that much to do with what actually happened inside the story. There were some with a scene displayed on the cover that never appeared, even remotely in the story and I always found that a bit frustrating. I know we all want to capture the audiences imagination and interest, but I want to make sure I'm being fair about it. 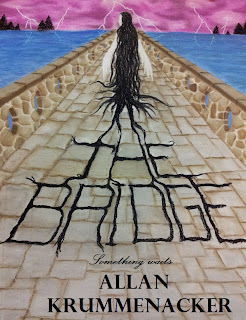 I thought you all might like to see how the cover of my novel is coming along. It's almost done. The editing of the novel itself is coming along nicely too. I'll let you all know when I start the formatting for Createspace, Kindle, Nook, PDF, paperback (i. e. print on demand), etc. 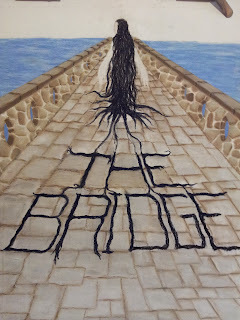 A few weeks ago I asked you all for your advice and opinions about what to do after my novel "THE BRIDGE" had been rejected after being considered for almost 2 years. Well, during those 2 years a lot has changed in the publishing world. E-books are now considered more acceptable than when they first started. In fact, some publishers and agents wait to see how well a self-published e-book does before considering taking an author on. They want to see how good the author is at self-promotion and getting their product out there and recognized as something that is a must read. From their point of view this takes some of the guess work out of whether or not the product is good and whether or not the author is willing to put in the work to help promote their product.